The Garden Academy > Vegetables > Onions – Seeds, Seedlings or Sets? 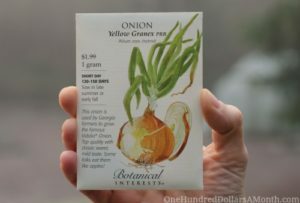 Onions – Seeds, Seedlings or Sets? Onions can be grown from seed, seedlings, or sets. Choosing the right one for you starts with understanding your options. Whichever method you select make sure you select short day varieties when planting on the Gulf Coast. Onion seed is inexpensive, and there are lots of varieties available. You can use seed to plant and grow onions in place, or to grow your own seedlings for later transplant. The main reason to grow from seed is diversity - there are more varieties available to you as seeds than can be found as seedlings or sets. There are gardeners who swear by growing onions from seed, saying that they will bulb faster, develop a larger bulb, and are less prone to bolting. Onion seed is reliably viable for one year. Growing Onions from Seed. 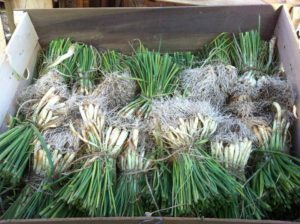 Seedling onions are young, slender onions that have been grown in the current growing season. Once the seedlings reach pencil size or slightly smaller, they are dug, bundled, and shipped for transplanting in your garden. The advantage of growing onions from seedlings is the ease of planting and near 100% survival rate. Growing Onions from Seedlings. 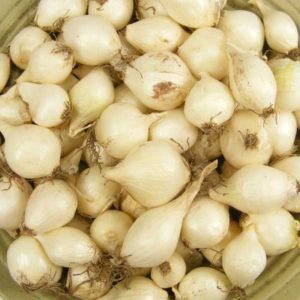 Sets are dormant, immature onions that were grown last season and have begin to bulb. They are dug and dried for packaging and shipment w hen they are 1/2" to 1" in diameter. Once they are transplanted into your garden, they should resume growth, which means resumption of bulb development and enlargement. Sets that are available in bags at home improvement stores are not the right varieties for our area. They will usually not produce a bulb. Do not buy any sets that are just labeled "white", "yellow", or "red". You cannot verify the day length requirement of these unnamed sets, and many are long day onions that will perform poorly here. Growing Onions from Sets. Some local independent nurseries and feed stores carry sets of suitable varieties for us. Verify that the varieties they carry are short day onions before you buy them. Sets that are less than 1/2" in diameter sometimes don't develop well, and those that are 1" or more will sometimes bolt before they bulb, especially if they are exposed to deep cold after planting. Try to select sets that are as close to 3/4" in diameter as possible. The term "set" is often used for both seedlings and small bulbs, but they are not truly interchangeable. I have found it pretty common for local nurseries to say they "have sets available" when what they really have is seedlings. If you are letting your fingers do the walking before you shop, make sure they are talking about seedlings before you make the trip. If they truly have sets (small bulbs), make sure they are short day onions before you buy.